For all the times you schlep a tablet somewhere, you probably use it as much, if not more often, at home.Lenovo says that 80% of consumers primarily use their tablets in the house, with more than half of home tablets shared by at least two people. You frequently watch TV on your slate as well. The Chinese company brought that perspective when it (with the assistance of actor and Lenovo product engineer Ashton Kutcher) designed the Yoga Tablet 2 Pro that I’ve been reviewing for a few days. Lenovo calls it a home entertainment tablet. I call it curiously appealing, and while not for everybody, an excellent buy at $499.99. Indeed, with a brilliant 13.3-inch Quad Core wide-angle display, the new Yoga has a much bigger screen than you typically see on a tablet, and a really good one at that. Given its size, you’re reminded of the company’s laptops rather than say a full-size iPad, especially since at just over 2 pounds, Yoga more than doubles the weight of the iPad Air 2. Yoga has a built-in JBL 5-watt subwoofer too, which complements a pair of rich-sounding front-facing 1.5-watt speakers, an experience enhanced by Dolby Audio technology. That’s something you don’t usually see, or hear, on other tablets either. A rather pleasant surprise comes with a built-in pico projector that turns this Android tablet into a portable home theater of sorts. The projector is hidden at one end of the same cylindrical chamber where the battery is housed. To be sure, the projector on Yoga Tablet 2 Pro is no substitute for the top-notch high-definition television that may anchor your current home theater. At 30 to 40 lumens with WVGA resolution (in tech-speak), it isn’t the brightest projector that I’ve ever come across. Still you can project wall-sized images — movies, pictures, anything else that appears on the tablet screen — of up to 50 feet. In a dimly lit room the images look fine. You turn the projector on or off by pressing a button on the side. You can fiddle with a separate control to focus. For most of us, an integrated projector is not a killer reason to buy a tablet. But you can certainly envision using it in a vacation home, dorm room, even outdoors during a nighttime movie-watching shindig. In other words it’s a nice convenience to have, even if you only employ it once in a blue moon. Incidentally, Lenovo says the projector lamp will last 20,000 hours, so the tablet may outlive its usefulness before the projector bulb gives way. That said, this is a very competent tablet in its own right, starting with the aforementioned display. Yoga runs Android Kit Kat software, with Lenovo committed to adding the Android Lollipop upgrade early next year. I’m not otherwise crazy about Lenovo’s own custom software. The machine has an Intel Atom processor and 32GB of storage, upgradable via a concealed microSD slot. I don’t envision using the rear 8-megapixel camera a lot — this is not an ideal design for shooting. You might exploit the front facing 1.6-megapixel camera more often, however, because the large screen would seem to invite video calls. Yoga products get their moniker because of the many ways in which you can position them. 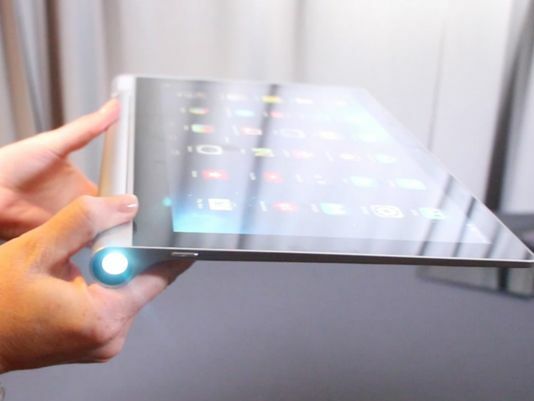 A button on the new tablet releases a sturdy but versatile metal kickstand that can be rotated nearly 180 degrees. One position is “stand mode,” helpful in tight quarters such as an airplane seat, or just when you want to prop the tablet onto a desktop to watch a movie. For typing, browsing or playing a game you’d typically be better off in “tilt mode” with the slate angled up from a flat surface. Tilt is also the proper mode for using the projector. “Hold mode” is just what it sounds like — but given the weight of this thing it’s not a position I’d necessarily use too often or for too long. I’m not sure how often I’d use “hang mode” either, but the idea is to hang Yoga on a hook using the open slot on the kickstand. If you are carting the tablet, the cylinder where the projector and battery live makes a great grip. Lenovo says you’ll get up to eight hours of battery life browsing and more than five hours using the projector. I didn’t do a formal test, but the claim seems reasonable based on my mixed usage — the cylindrical chamber can has room for a bigger battery. You can have Kutcher himself show off Yoga Tablet 2 Pro by summoning his virtual reality 4-D likeness inside an app called Daqri. The experience comes off as hokey, but that’s showbiz. And in pushing the new Yoga, Lenovo is all about entertainment.